At that time, web technologies were emerging and Java had applets and Swing within them. You could do pixel perfect positioning or flexible positioning (GridBagLayout) in applets, which is something HTML could not offer at that time. On the backend, one could pick from a range of remoting options to scale your code. Your binary would run on almost any platform conceived. The underlying language that enabled all of this, Java itself, was designed from ground up to be modern, flexible, well written and really innovative. Memory management was handled by the Garbage collector. It was a dream come true! Java soon became the leader of the pack. Companies such as CloudBees provide the build/integrate/deploy tools. Jenkins is being used at 60% of today’s projects. You get the picture, although this list could easily continue a long way. The Java programmer’s body of knowledge consists of much more than the Java language. Or to be honest, Java is just a small bit of the knowledge and an even smaller bit of your project workspace. This remained a fact throughout Java’s history. Truth is — the Java ecosystem was always a crowd-sourced effort and never a truly centrally managed effort. Java barely fought a battle for the desktop environment. Efforts such as JavaFX were too little too late. Microsoft is still leading this area and will probably benefit even more from the Xamarin acquisition. Still, Java ecosystem is stronger than ever (in absolute terms), thanks in most part to the non-governing parties. Number one reason for this is Google’s choice of Java as the programming environment for the most popular OS of today — Android OS. Spring, now part of Dell, is also helping Java stay strong by producing top quality frameworks for rapid development. 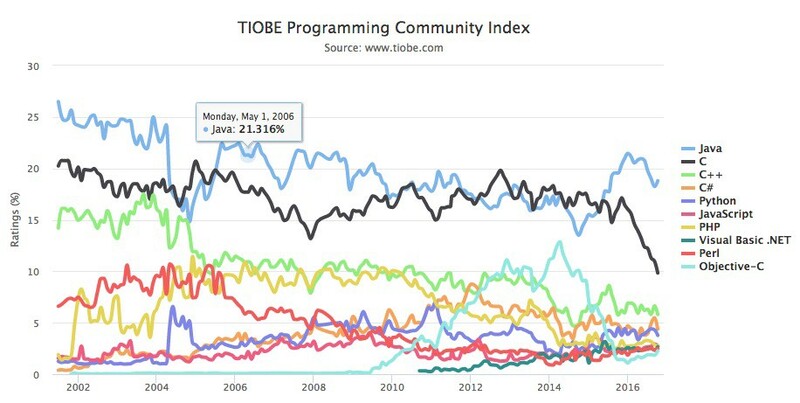 But most importantly, the Java community in large is the leading community in bringing new principles and practices to the software development world. Almost every new concept introduced to software programming in general — originates in the Java ecosystem: Continuous integration, Continuos delivery, Microservices. The crowd is helping keep Java on top! Oracle is really just owning the Java trademark and is not really governing its future. This may be a good or a bad thing for Java. On the downside, some of the more monolithic environments are gaining strength (Go lang, .Net env) from their focused work. On the bright side, Java’s democracy seems to still be giving birth to innovative trends (CI, CD). Arrival of languages like these was the last missing link in making the Java language even less relevant in the JVM ecosystem. They allow for a swift migration from Java, without loosing all the benefits of the ecosystem. At the same time, Oracle is not doing itself and Java a favor by pushing back the releases of project Jigsaw. We are at a crossroad for Java as a language and the JVM ecosystem. What happens next? When looking at the trends it is safe to stay that JVM and its surroundings are going to be leading the software development world for many years to come. Languages that build up a mass like this, never really decline (look at C at the charts above). JVM ecosystem still delivers the best tools to to the job of enterprise software development. Oracle focuses more on the language and the frameworks, finding a business model for it. My guess is that the JVM world is going to remain crowd-sourced and very vibrant, no matter what happens. It is in the nature of the ecosystem and people in it are motivated by this model. 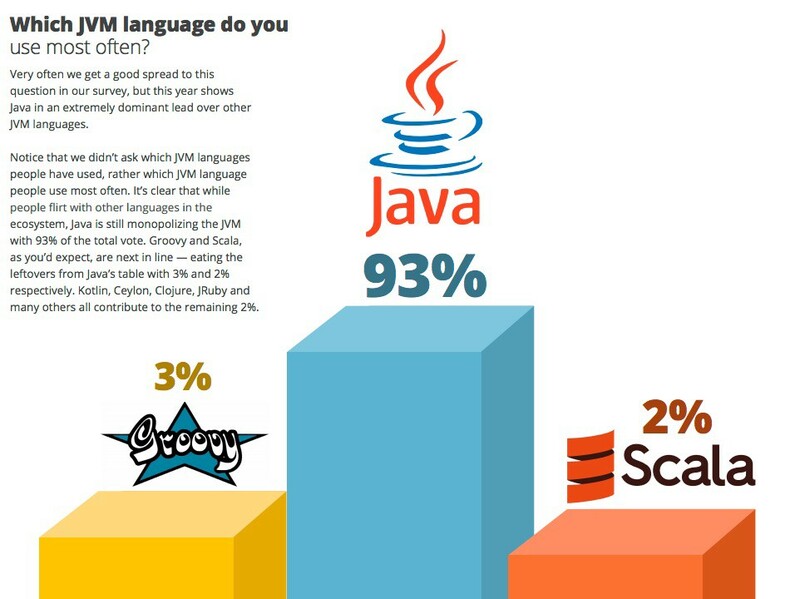 Whether Java as a language is going to be a critical part of it, still remains to be seen. AG04 Experts in enterprise software development!